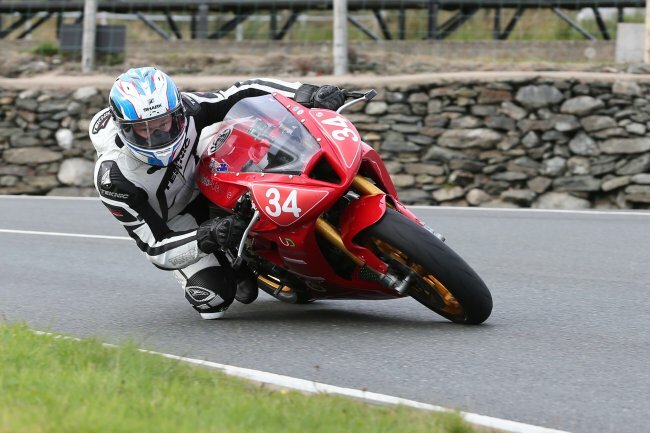 The Isle of Man’s Michael Evans continued the form that saw him dominate qualifying for the MGP ‘Newcomer A’ class to win the opening race of the 2016 Manx Grand Prix meeting. However, their was drama in the Newcomer B Race when Cheshire’s Jonathan Perry, who had built up a lead of over 16 seconds after the opening two laps, had a disastrous pit stop and lost the race to Australian Paul Van Der Heiden. After a delay of ten minutes the IMGold Manx Grand Prix newcomers A and B Race got underway at 5.10pm. Conditions were excellent all round the course although damp patches were reported, notably at the exit point of Laurel Bank. 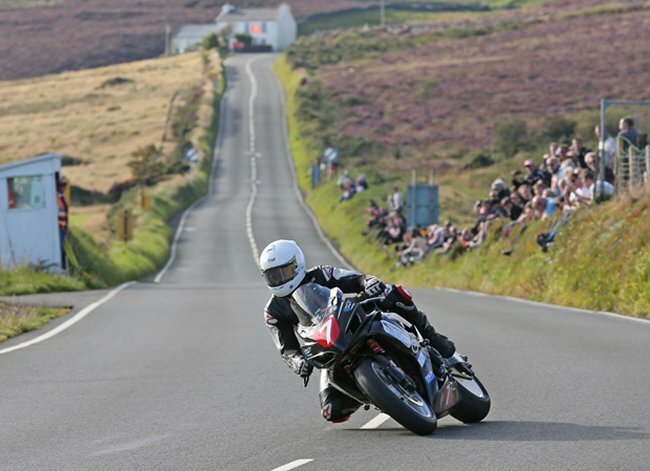 In a change to previous policy, the riders were seeded based on their qualifying times which meant that the Isle of Man’s Michael Evans was first away following his sensational times during practice – most notably Saturday’s 119.758 followed by fellow Manx competitor Brendan Fargher. Although Evans was first to Glen Helen, opening up a gap of 4.4 seconds over Fargher, it was actually Wayne Humbles, the third fastest qualifier, from Cumbria who was fastest to Glen Helen, leading Evans by a second and a half. Jamie Williams from the Isle of Man was ahead of Fargher by Glen Helen on the opening lap but Fargher moved into third place by over three seconds at Ballaugh with Austrian Julian Trummer completing the top five. However, all eyes were focused at the front of the field where Evans had cut Humble’s lead to half a second by Ramsey with Fargher only a further two seconds behind the leading pair in third. Evans moved into the front of the field at Cronk Ny Mona and his opening lap of 116.291 / 19:27996 gave him a lead of 2.3 seconds from Humble with Fargher (115.538) a further five seconds back in third. Jamie Williams (115.170) remained in fourth at the end of the opening lap, just under four seconds behind Fargher with Trummer completing the top five and Spain’s Raul Torras Martinez (114.044) in sixth a further ten seconds behind the Austrian. Sean Montgomery, who had been running in 9th place, was reported off at Sarah’s Cottage but unhurt. Williams lost time on the opening sector of the second lap, which saw Trummer move five seconds ahead of the Manx rider but Evans continued to set the pace and by Ramsey on the second lap he had extended his lead to over six seconds from second placed Humble. Coming into the pits at the end of the second lap, Evans’s 117.034 gave him a healthy lead of over 12 seconds from Humble with Fargher a further nine seconds behind in third and Trummer maintaining his fourth place. While Evans continued to maintain a healthy advantage over Humble, there was battle for the final podium places with Humble, Fargher and Trummer with the gap between Fargher and Trummer only 2 seconds by Ballaugh on the third lap. Evans continued to press and by the end of the third lap he had increased the gap over Humble to a decisive 24 seconds. However, behind the leading pair, Trummer moved into third and opened up a gap of over six seconds from Fargher, the majority of which came in the final sector from Cronk Ny Mona to the Grandstand. Evans clinched the win with a final lap of 115.848/ 19:32.465, which gave him a race time of 115.196/ 1:18.36.409. Trummer’s late charge saw him focus his attention on second placed Humble and he had closed the gap to just over 3 seconds by Ballaugh. The Austrian moved ahead of Humble at Ramsey, albeit by less than a second. That remained the gap at Cronk – Ny – Mona and Trummer held on to take second place with a race time of 114.591/ 1:19.01.334 by only 0.4 seconds from Humble 114.579/ 1:19.01.798. In the Newcomers B Race, Cheshire’s Jonathan Perry was narrowly outside the class lap record on his first lap, clocking 109.301/ 20:422.699 which gave him an eleven second lead from Van Der Heiden (108.299/ 20:54.192 with Marc Ironside (107.335/ 21:05.460 a further eleven seconds behind the Australian in third. Perry went even quicker on his second lap and even though he was slowing down for the pits, he still posted a lap of 110.1309, which gave him a lead of over sixteen seconds. However, Perry had a disaster in the pits, taking over 2 minutes and forty-two seconds as a result of a blown starter fuse, which meant that Van Der Heiden moved into the lead by Glen Helen, ten seconds ahead of Marc Ironside with Dave Butler moving up into third. Perry rejoined the race but was over a minute and thirty seconds off the final podium place. Van Der Heiden’s third lap of 105.422 (21:28.418) gave him a lead of over ten seconds from second placed Ironside but behind the leading pair, Perry was fighting back.